I have somewhat of an embarrassing confession to make. I am an electric toothbrush virgin. It's true. Not only have I never used an electric toothbrush but I am the only person in my household without one. Even my 2 year old uses one. It's shameful. It's not that I have some kind of an aversion to tossing my manual brush I just have simply never put that much thought into making the switch. Like most Moms I run in overdrive day to day putting my families needs first. Doing my best to stay afloat amongst the daily to-dos leaves little time for thinking of myself. Now that we have a third little one on the way it has made me realize it's either now or never. We wouldn't let our children fluff off their dental health...why should we treat ourselves any different?? With a wedding date only 2 weeks away starting the Sonicare Flexcare+ challenge seemed like just the right way to jump start my preparations for the big day and start taking my dental health seriously!! 2 weeks to healthier teeth and gums...I'm all over it. Thanks to Mom Central Canada my old manual has hit the road and my soon-to-be husband is green with envy over my new (and much cooler than his) Phillips Sonicare Flexcare+ brush. You can join in on the fun too by scoring one of these amazing complete gum care systems of your own with our giveaway!! So you want one of your very own right?? Of course you do!! Entering is EASY. Comment on this post letting us know why you want to make the Sonicare switch and you'll be eligible to win a Phillips Sonicare Flexcare+ power brush valued at $219.95. Please be sure to leave us your email address. Contest is open to Canadian residents only and all entries must be received by August 10, 2011. Readers may enter this contest on multiple blogs but are only eligible to win one Sonicare Flexcare+ complete gum care package. Disclosure – I am participating in the PHILIPS SONICARE FLEXCARE+ program by Mom Central Canada on behalf of Philips Canada. I received a Sonicare product pack and a gift card as a thank you for my participation. The opinions on this blog are my own. Who wouldn't want to make the switch? I have some close together, there are spots that never feel clean enough (around the gaps). Would be awesome to win! I would love to make the switch because I have cavity prone teeth so I'm always looking for ways to improve my oral health routine. I also love the fact that this brush has a sanitizer! I love that there is a setting for gum care,I have been having trouble with my gums for years that would help so much .this brush would make my mouth happy :) I'm ready to switch . I would love to make the switch because I need a new toothbrush, my current toothbrush is battery opperated and drains the batterys way to quick. I would love to make the switch! Every time I visit the dentist, they bring out the sonic cleaner and I would love to be able to avoid that thing! I would love to make the switch with you. Like yourself Lyndsay I am an electric toothbrush virgin, and would love to throw my manual brush out. I think its time I make the switch to Sonicare Flexcare! I would LOVE to make this switch! I have been dreaming of doing it for a while now! Talk about the perfect clean and great care for your gums!!! What more could anyone want in a toothbrush...well the sanitizer is a bonus and kudos to whomever thought of that one!! Would love to win...thanks for the chance!! I'm ready for the switch, so are my slowly receding gums! I'd like to switch because it'd make brushing my toddler's teeth a lot easier! I would love to win this for my husbnd who hates going to the dentist. I would like him to have healthy teeth. I desperately need one as my toothbrush isnt doing it. My parents had false teeth so paranoid about healthy gums and think the sonicare would help. Plus in my house I have a man that brushes his teeth way too hard and a little girl that doesn't brush long enough so we need help !! I want to win this teeth cleaning system because I believe in taking responsability for my well being. Each day our teeth need to be cleaned to prevent tooth decay, and diseases. This system will assist in keeping my teeth clean, and it will clean well. 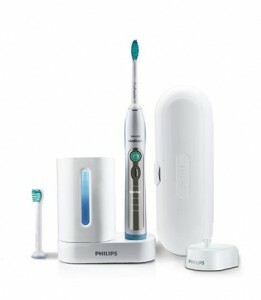 I have an Oral B electric brush but this Philips looks wonderful so I would like to try it out. That would fix the problem of somehow not brushing enough on one side of my mouth compared to the other!!! I was a Sonic Care owner for 5 yrs and absolutely loved the clean. Unfortunately price is the issue to replace it. Winning this would be super! I love to win this for my husband who's cheap powerbrush needs to be replaced. I have never tried Sonicare before and one with UV ... wicked. Oooh! I would totally make the switch! I love that it has a timer and different settings, and the UV sanitizer is a great idea. I started using an a battery operated tooth brush, my dentist recommended it. I love how it takes care of teeth and gums. I would love the Sonicare Flexcare and who wouldn't. I would love to win this awesome dental health care system. I really need a great system for cleaning my teeth that are so tight together. I may get that million dollar smile after all. I would love to win this because I have never had a good toothbrush like this and my dentist said they can make a world of difference! I brush my teeth twice daily, sometimes even more. I floss often yet I still dental problems..It's definately time for me to toss out my manual brush and switch to Philips Sonicare electronic brush!! My dentist has warned me that without proper oral hygiene problems can occur. With the Sonicare Flexcare system it would be so much easier to take proper care of my teeth! I have never used an electric toothbrush in my life...always wanted one, but never took the plunge. Would love that tingly clean teeth feeling all the time! I am also an electronic toothbrush virgin! I would love to make the switch to have healthier teeth and gums. I'm sure this toothbrush would do a much better job than my current battery powered one! Would love to switch back to sonicare - mine gave out a few weeks ago after several years. Sonicare is great! Not the same using a regular toothbrush! I'd like to win to take better care of my teeth. I had the previous model for three years and it was amazing ... just broke a couple of weeks ago so would love to try the updated version! as I get older my teeth are getting harder and harder to take care of. I'm nervous that soon I'll have to get dentures and I'm not looking forward to that. If this will help me keep my teeth, I'm all for it! Would love to make the switch from my regular toothbrush and have healthier gums! Pretty Manis. Just Because We Can. © 2009-2011 itmom All Rights Reserved. Powered by Blogger.